WOYWW 194 – neat and organized! As I was doing a general every-room tidy up thru the house I figured I might as well sort of my desk and floor. I had a few ideas I wanted to try today with my current obsession, my Gelli plate, but was frustrated by having the paint all ready to go and sifting thru piles of things, looking for this stencil or that stamp or the other texture plate. At least to begin with I wanted things separate so I could hopefully grab what I needed before the paint got too dry to pull! I am totally ready to rock & roll! Now, I note that Julia has done a posted “made me smile” thing, hosted by fellow WOYWW-er Wipso (Annie). In my cleaning I came across a fair few old magazines. As is my way, I had to flip thru every one to make 100% sure there wasn’t some little gem of inspiration that I would regret getting rid of before it went to the recycling. This ad from the 90s made me more than smile, it made me laugh out loud. We crafters like to bring a bit of our “art” to our home decor, and I get that there are people who are as passionate about latch-hook rugs and crochet as I am about ink and paint and scrapbook layouts. I like a bit of crochet myself, if I’m honest. Let’s look small and the expand out view, shall we? A perfectly nice living room corner – OK, so the plaid chair is maybe a bit much, and certainly the lamp cord should be hidden, but overall, I could live there. Surprise is not the word I would use – more like horrify, perhaps? Give nightmares to? OMG. Check out the “new and improved” craft-enhanced space! Dear God! The only thing that would make this worse is if those puppies were playing poker! 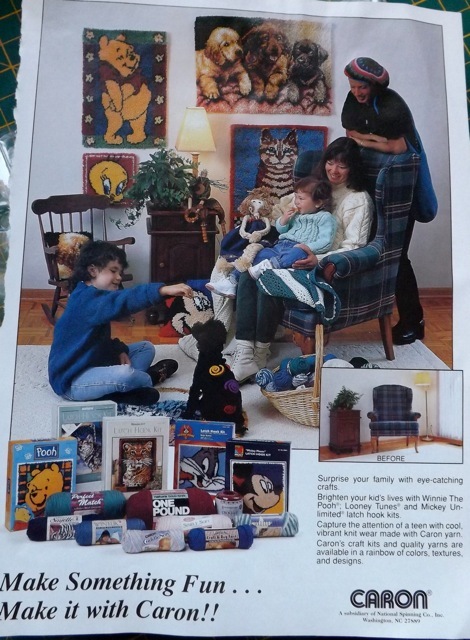 Everything about it is just so WRONG – from the jaunty beret on the teenager, to the 1000-yard stare on that cat, to the poodle’s spiral embellished jumper. FUN , they say? Not the word I would use….. Happy WOYWW! I’m doing my best but there are just some blogs I am simply not able to comment on (including Julia’s) But know I am probably visiting you even if I leave to trace of my presence! I’m with Kay, I’m in so much shock at that after photo that I can’t even recall if I saw your desk or not! What a God awful way to ruin what looked to be quite a nice corner of a room!! Who in their right minds would have wanted that, even in the 90’s!! I just scrolled back up and saw gelli plates, and that reminds me that I saw the results of your playing with paper, pretty cool. I wonder if in 20 years time we’ll see your gelli plate art decorating the corner of a room in some funky advert lol!! O.k. a confession. 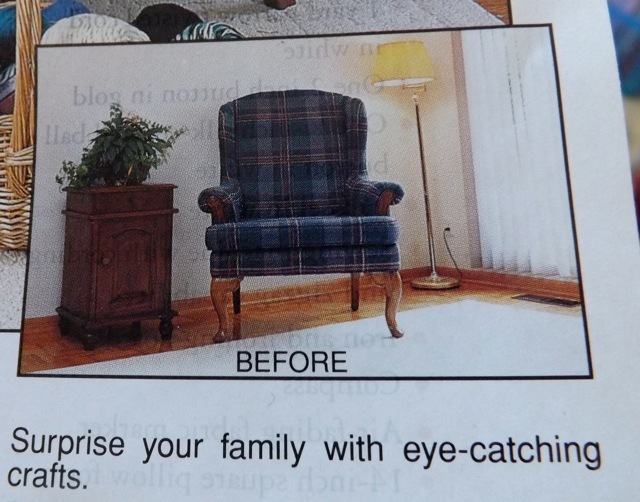 I liked the plaid chair…… but the after photo….. I was in SHOCK. I mean, I can’t even remember what your desk looks like. 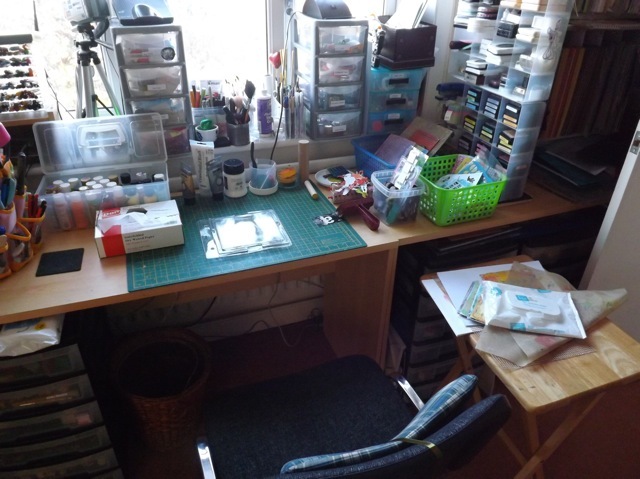 But I do remember you mentioning gelli plates and now that I think about it, your desk was pretty dang neat! Thanks for visiting me already and leaving a lovely comment. hee hee LOL etc I really did…. so much so that I had a full blown hot flush (such is my life). that is so scary… but here’s the thing…. I still sell those at work and plastic canvas for making tissue box holders… me thinks we need to up date our customer base. I’ll get back to you! Thanks for the offer to pop in en route to Brighton! Such a nice thought and I’d take you up on it but I’m going by myself on the coach (long but VERY cheap). Next time when we’re in the car watch out! I still need to buy a gelli plate. So much fun!! Yes, picture completely horrifying. Ugh. Enjoy hopping around the world today nosing into people desks. 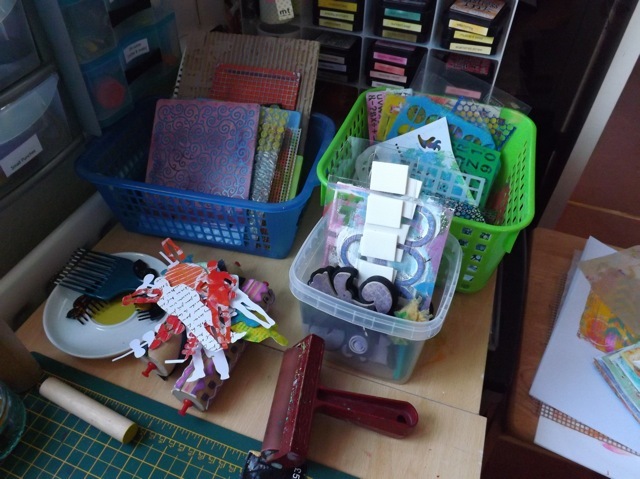 Fantastic work space – have a fun week crafting. I am right there with you on the horror of the before and after picture not a happy change in my book. I keep hearing about these Gelli Plates but have not seen one or seen it used so I am coming back to see what you do with it. The advert is priceless! So kitch. I really think that it’s the Dad trying hard to be a hippy and not a teenager. Look again very hard! I recently spotted the caretaker at our craft group, sitting in the reception hall embroidering a native American Indian picture on 70 count!!! Yes 70 count canvas !!! that she had to work on with a large magnifier. She had finished less than a quarter in 7 years!! WHY??? From 2 feet away it looked like a photo therefore it might as well be a photo! Much more fun making an inky mess! I am completely addicted to the gelli plate and love what you have been doing in a previous post. Craft add is horrendous … would make anyone run in the opposite direction. Oh can you imagine that we might have fallen for that sort of mrketing? I like to think that even back then I would have been horrified….ghastly…and as much as Im into crochet..that beret is EVERYTHING I don’t like about it!! Meanwhille your Gellivestigation goes on..aren’t you an all or nothing gal! Like the neat basket arrangements…a place for everything..
And they say that there’s been no progress since the 90s!! thank God there has! Ad thank you for giving me the biggest laugh this morning, I snorted cereal all over the table…….. Such a tidy work space well done to your tidy up as for the magazine I’m speechless !!!!!!! I am off to the gelli plate post now. I am with you on the scary advert! Preferred the before shot myself! I too had a major clean up, must be something in the air the world over at the moment! Lol. And look at what that poor dog has to wear!